Bringing the governing power of the Lord into your life is a process that begins at being ‘born-again’. It continues as you enter into the fullness and maturity of Christ. To be governed by God means His principles, His purposes, and His nature become embedded in your soul to the degree that you reflect Jesus as you live ‘normal’ life. It is in this place that the Kingdom of God is established within you facilitating an outward expression of His kingdom in your circumstances and your sphere of human influence. An essential element of God’s government in you is the concept of ‘giving’. The Father gave His only son so we could live. The son gave His life as a sacrifice so we could live to give. The 1st century apostles gave their lives for the sake of the gospel as models of what it means to ‘give your life’ for the sake of the gospel. Jesus said ‘Freely you have received, freely give’. (Matt. 10:8) It sounds so easy but ‘living to give’ for the sake of the gospel is not easy. It requires losing life as you know it, to find life as you will know it. Leaders, like Paul and other ministers, gave their life to the point of death. There are many contemporary examples of men and women who now live to give, and give to live, whether in money, time, teaching, mentoring, counseling, pastoring, etc. They give their lives freely because they received Jesus’ life freely. I think of my wife, Deborah, who lives to give. She lives for the gospel. She speaks it, breathes it, and converses about it. It is her lifestyle. It is who she is. From the day she was born-again she was a giver. As she entered full time ministry she was a giver. But it took a dramatic turning point before she lived to give. 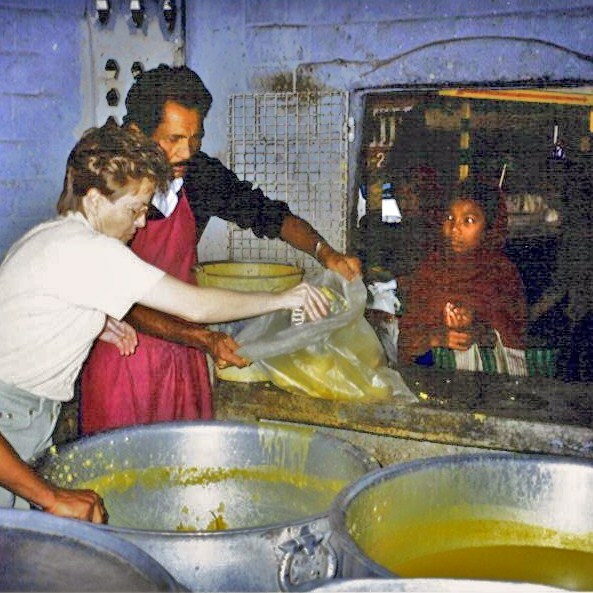 It was many years ago in Calcutta, India where the Lord had told her to ‘Go and see the work’. She did not preach, teach or do any pulpit ministry. She simply went to ‘see the work’ of an American couple, Mark and Hulda Buntain, who had given their life to ministering the gospel in Calcutta. In only a few days of seeing the overwhelming need and the overwhelming sacrifice required to begin to meet that need, she came to a turning point. It was the turning point of seeing what Jesus sees, the need to preach the gospel and make disciples of all nations. It was the turning point of seeing that the American perspective of living for the gospel may not fully represent ‘living to give and giving to live’. From that point forward she lives to give for the sake of the gospel. As leaders in the body of Christ we are called to this higher level of modeling the concept of giving. Giving is an essential element of the government of God within us. It is an absolute in a world that despises absolutes. You might say, ‘but life is so busy already, what more can I give?’ If you, as a leader, desire this aspect of God’s impact within you, simply ask Him to reveal those areas of your life that can be ‘lost’ so that you can freely give. The Holy Spirit is faithful to show you the fullness of giving for the sake of the gospel. And…He has abundant grace to live it daily.